For other uses, see Perseus (disambiguation). In Greek mythology, Perseus (/ˈpɜːrsiəs, -sjuːs/; Greek: Περσεύς) is the legendary founder of Mycenae and of the Perseid dynasty. He beheaded the Gorgon Medusa for Polydectes and saved Andromeda from the sea monster Cetus. He was the son of Zeus and the mortal Danaë, as well as the half-brother and great-grandfather of Hercules. Because of the obscurity of the name Perseus and the legendary character of its bearer, most etymologists presume that it might be pre-Greek; however, the name of Perseus’ native city was Greek and so were the names of his wife and relatives. There is some idea that it descended into Greek from the Proto-Indo-European language. In that regard Robert Graves has proposed the only Greek derivation available. Perseus might be from the Greek verb, "πέρθειν" (perthein), "to waste, ravage, sack, destroy", some form of which appears in Homeric epithets. According to Carl Darling Buck (Comparative Grammar of Greek and Latin), the –eus suffix is typically used to form an agent noun, in this case from the aorist stem, pers-. Pers-eus therefore is a sacker of cities; that is, a soldier by occupation, a fitting name for the first Mycenaean warrior. A Greek folk etymology connected the name of the Persian (Pars) people, whom they called the Persai. The native name, however, has always had an -a- in Persian. Herodotus recounts this story, devising a foreign son, Perses, from whom the Persians took the name. Apparently the Persians knew the story as Xerxes tried to use it to bribe the Argives during his invasion of Greece, but ultimately failed to do so. Perseus was the son of Zeus and Danaë, the daughter of Acrisius, King of Argos. Disappointed by his lack of luck in having a son, Acrisius consulted the oracle at Delphi, who warned him that he would one day be killed by his daughter's son. In order to keep Danaë childless, Acrisius imprisoned her in a bronze chamber, open to the sky, in the courtyard of his palace: This mytheme is also connected to Ares, Oenopion, Eurystheus, and others. Zeus came to her in the form of a shower of gold, and impregnated her. Soon after, their child was born; Perseus—"Perseus Eurymedon, for his mother gave him this name as well" (Apollonius of Rhodes, Argonautica IV). Fearful for his future, but unwilling to provoke the wrath of the gods by killing the offspring of Zeus and his daughter, Acrisius cast the two into the sea in a wooden chest. Danaë's fearful prayer, made while afloat in the darkness, has been expressed by the poet Simonides of Ceos. Mother and child washed ashore on the island of Serifos, where they were taken in by the fisherman Dictys ("fishing net"), who raised the boy to manhood. The brother of Dictys was Polydectes ("he who receives/welcomes many"), the king of the island. When Perseus was grown, Polydectes came to fall in love with the beautiful Danaë. Perseus believed Polydectes was less than honourable, and protected his mother from him; then Polydectes plotted to send Perseus away in disgrace. He held a large banquet where each guest was expected to bring a gift. 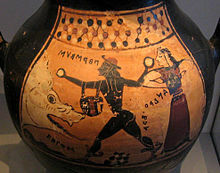 [note 1] Polydectes requested that the guests bring horses, under the pretense that he was collecting contributions for the hand of Hippodamia, daughter of Oinomaos. Perseus had no horse to give, so he asked Polydectes to name the gift; he would not refuse it. Polydectes held Perseus to his rash promise and demanded the head of the only mortal Gorgon, Medusa, whose gaze turned people to stone. Ovid's account of Medusa's mortality tells that she had once been a woman, vain of her beautiful hair. Poseidon, the god of the seas, raped her inside of a temple dedicated to Athena, and as punishment for the desecration of her temple, Athena had changed Medusa's hair into hideous snakes "that she may alarm her surprised foes with terror". Athena instructed Perseus to find the Hesperides, who were entrusted with weapons needed to defeat the Gorgon. Following Athena's guidance, Perseus sought the Greae, sisters of the Gorgons, to demand the whereabouts of the Hesperides, the nymphs tending Hera's orchard. The Graeae were three perpetually old women, who had to share a single eye. 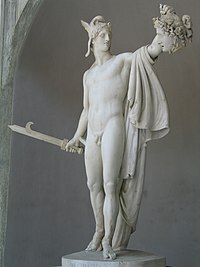 As the women passed the eye from one to another, Perseus snatched it from them, holding it for ransom in return for the location of the nymphs. When the sisters led him to the Hesperides, he returned what he had taken. From the Hesperides he received a knapsack (kibisis) to safely contain Medusa's head. Zeus gave him an adamantine sword (a Harpe) and Hades' helm of darkness to hide. Hermes lent Perseus winged sandals to fly, and Athena gave him a polished shield. Perseus then proceeded to the Gorgons' cave. In the cave he came upon the sleeping Medusa. By viewing Medusa's reflection in his polished shield, he safely approached and cut off her head. From her neck sprang Pegasus ("he who sprang") and Chrysaor ("sword of gold"), the result of Poseidon and Medusa's mating. The other two Gorgons pursued Perseus, but, wearing his helm of darkness, he escaped. From here he proceeded to visit King Atlas who had refused him hospitality; in revenge Perseus turned him to stone. On the way back to Seriphos, Perseus stopped in the kingdom of Aethiopia. This mythical Ethiopia was ruled by King Cepheus and Queen Cassiopeia. Cassiopeia, having boasted that her daughter Andromeda was equal in beauty to the Nereids, drew the vengeance of Poseidon, who sent an inundation on the land and a sea serpent, Cetus, which destroyed man and beast. The oracle of Ammon announced that no relief would be found until the king exposed his daughter Andromeda to the monster, and so she was fastened naked to a rock on the shore. Perseus slew the monster and, setting her free, claimed her in marriage. As Perseus was flying in his return above the sands of Libya, according to Apollonius of Rhodes, the falling drops of Medusa's blood created a race of toxic serpents, one of whom was to kill the Argonaut Mopsus. On returning to Seriphos and discovering that his mother had to take refuge from the violent advances of Polydectes, Perseus killed him with Medusa's head, and made his brother Dictys, consort of Danaë, king. Perseus then returned his magical loans and gave Medusa's head as a votive gift to Athena, who set it on Zeus' shield (which she carried), as the Gorgoneion (see also: Aegis). The fulfillment of the oracle was told several ways, each incorporating the mythic theme of exile. In Pausanias he did not return to Argos, but went instead to Larissa, where athletic games were being held. He had just invented the quoit and was making a public display of them when Acrisius, who happened to be visiting, stepped into the trajectory of the quoit and was killed: thus the oracle was fulfilled. This is an unusual variant on the story of such a prophecy, as Acrisius' actions did not, in this variant, cause his death. Edward Burne-Jones: The Baleful Head, 1885, Staatsgalerie Stuttgart. This part of the series plays with the theme of the reflected gaze, as Perseus has Andromeda look at the Gorgon's head, but only as reflected in the well. In the Bibliotheca, the inevitable occurred by another route: Perseus did return to Argos, but when Acrisius learned of his grandson's approach, mindful of the oracle he went into voluntary exile in Pelasgiotis (Thessaly). There Teutamides, king of Larissa, was holding funeral games for his father. Competing in the discus throw Perseus' throw veered and struck Acrisius, killing him instantly. In a third tradition, Acrisius had been driven into exile by his brother Proetus. Perseus turned the brother into stone with the Gorgon's head and restored Acrisius to the throne. Then, accused by Acrisius of lying about having slain Medusa, Perseus proves himself by showing Acrisius the Gorgon's head, thus fulfilling the prophecy. Having killed Acrisius, Perseus, who was next in line for the throne, gave the kingdom to Megapenthes ("great mourning"), son of Proetus, and took over Megapenthes' kingdom of Tiryns. The story is related in Pausanias, who gives as motivation for the swap that Perseus was ashamed to have become king of Argos by inflicting death. In any case, early Greek literature reiterates that manslaughter, even involuntary, requires the exile of the slaughterer, expiation and ritual purification. The exchange might well have proved a creative solution to a difficult problem; however, Megapenthes was required to avenge his father, which, in legend, he did, killing Perseus, but only at the end of his long and successful reign. The two main sources regarding the legendary life of Perseus—for he was an authentic historical figure to the Greeks— are Pausanias and the Bibliotheca. Pausanias asserts that the Greeks believed Perseus founded Mycenae. He mentions the shrine to Perseus that stood on the left-hand side of the road from Mycenae to Argos, and also a sacred fountain at Mycenae called Persea. Located outside the walls, this was perhaps the spring that filled the citadel's underground cistern. He states also that Atreus stored his treasures in an underground chamber there, which is why Heinrich Schliemann named the largest tholos tomb the Treasury of Atreus. Apart from these more historical references, the only accounts of him are from folk-etymology: Perseus dropped his cap or found a mushroom (both named myces) at Mycenae, or perhaps the place was named from the lady Mycene, daughter of Inachus, mentioned in a now-fragmentary poem, the Megalai Ehoiai. For whatever reasons, perhaps as outposts, Perseus fortified Mycenae according to Apollodorus along with Midea, an action that implies that they both previously existed. It is unlikely, however, that Apollodorus knew who walled in Mycenae; he was only conjecturing. In any case, Perseus took up official residence in Mycenae with Andromeda. According to Hyginus, Fabulae 244, Megapenthes eventually killed Perseus, to avenge the death of his father. 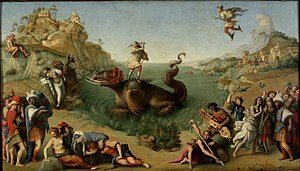 Perseus and Andromeda had seven sons: Perses, Alcaeus, Heleus, Mestor, Sthenelus, Electryon, and Cynurus, and two daughters, Gorgophone and Autochthe. Perses was left in Aethiopia and was believed to have been an ancestor of the Persians. The other descendants ruled Mycenae from Electryon to Eurystheus, after whom Atreus got the kingdom. However, the Perseids included the great hero, Heracles, stepson of Amphitryon, son of Alcaeus. The Heraclides, or descendants of Heracles, successfully contested the rule of the Atreids. A statement by the Athenian orator, Isocrates helps to date Perseus approximately. He said that Heracles was four generations later than Perseus, which corresponds to the legendary succession: Perseus, Electryon, Alcmena, and Heracles, who was a contemporary of Eurystheus. Atreus was one generation later, a total of five generations. The replacement of Bellerophon as the tamer and rider of Pegasus by the more familiar culture hero Perseus was not simply an error of painters and poets of the Renaissance. The transition was a development of Classical times which became the standard image during the Middle Ages and has been adopted by the European poets of the Renaissance and later: Giovanni Boccaccio's Genealogia deorum gentilium libri (10.27) identifies Pegasus as the steed of Perseus, and Pierre Corneille places Perseus upon Pegasus in Andromède. Modern representations of this image include sculptor Émile Louis Picault's 1888 sculpture Pegasus. ^ Such a banquet, to which each guest brings a gift, was an eranos. The name of Polydectes, "receiver of many", characterizes his role as intended host but is also a euphemism for the Lord of the Underworld, as in the Homeric Hymn to Demeter 9, 17. ^ Hofmann, J. B. (1950). Etymologisches Wörterbuch des Griechischen (in German). Munich: R. Oldenbourg. ^ "Even thus endured Danaë in her beauty to change the light of day for brass-bound walls; and in that chamber, secret as the grave, she was held close" (Sophocles, Antigone). In post-Renaissance paintings the setting is often a locked tower. ^ Trzaskoma, Stephen; et al. (2004). Anthology of classical myth: primary sources in translation. Indianapolis, IN: Hackett. ISBN 978-0-87220-721-9. ^ For the familiar motif of the Exposed Child in the account of Moses especially, see Childs, Brevard S. (1965). "The Birth of Moses". Journal of Biblical Literature. 84 (2): 109–122. JSTOR 3264132. And Redford, Donald B. (1967). "The Literary Motif of the Exposed Child (Cf. Ex. ii 1–10)". Numen. 14 (3): 209–228. doi:10.2307/3269606. Another example of this mytheme is the Indian figure of Karna. ^ Ovid, as a Roman writer, uses the Roman names for Poseidon and Athena, "Neptune" and "Minerva" respectively. ^ Pseudo-Apollodorus, Bibliotheke 2. 37–39. ^ William Godwin (1876). "Lives of the Necromancers". p. 39. ^ Perseus and Andromeda had seven sons: Perseides, Perses, Alcaeus, Heleus, Mestor, Sthenelus, and Electryon, and one daughter, Gorgophone. Their descendants also ruled Mycenae, from Electryon to Eurystheus, after whom Atreus attained the kingdom. Among the Perseids was the great hero Heracles. According to this mythology, Perseus is the ancestor of the Persians. ^ Hesiod, Megalai Ehoiai fr. 246. ^ 2.4.4, pros-teichisas, "walling in"
^ Johnston, George Burke (1955). "Jonson's". The Review of English Studies. New Series. 6 (21): 65–67. doi:10.1093/res/VI.21.65. JSTOR 510816. 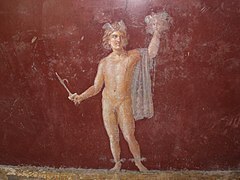 Wikimedia Commons has media related to Perseus.